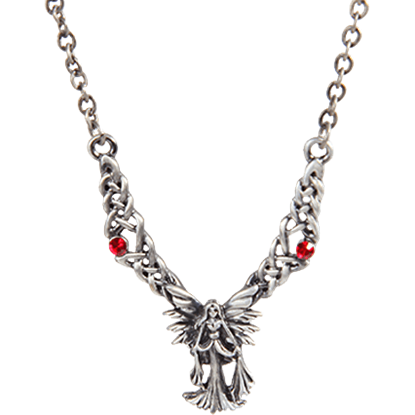 Harness the beauty of a fantasy creature with the Atilla Fairy Necklace, which is as versatile is it is stunning. Your wardrobe has been needing a fresh accent and this item can be the creative solution that will liven things up. Born of magic, fairies are capable of doing almost anything they want. So if a fairy wants to sit on the curve of the crescent moon, she can. 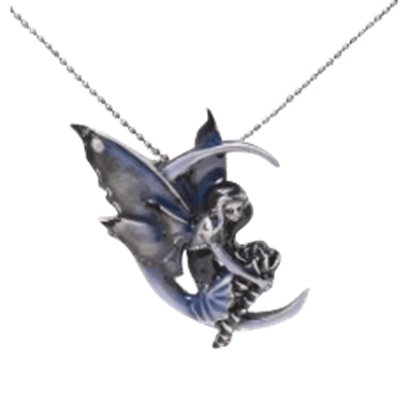 We have captured that moment and fairy for you to enjoy as this Blue Moon Diva Fairy Necklace. Born of magic, fairies are capable of doing almost anything they want. If a fairy wants to sit on the curve of the crescent moon, she can. 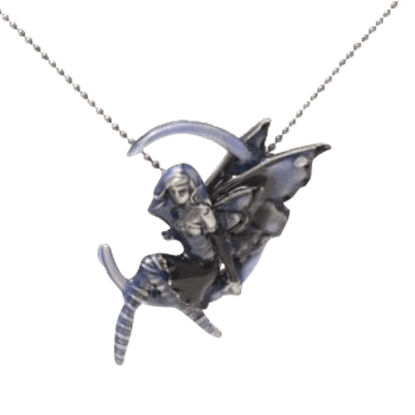 We have captured that moment and fairy for you to enjoy in this Blue Moon Diva II Fairy Necklace. This celestial fairy seems to have caught a yellow star in her hands. 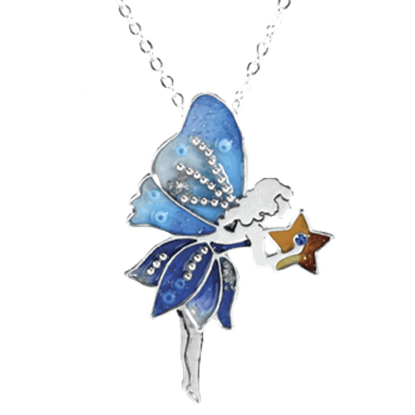 The Blue Star Fairy Necklace depicts this delicate fantasy creature in beautiful detail. 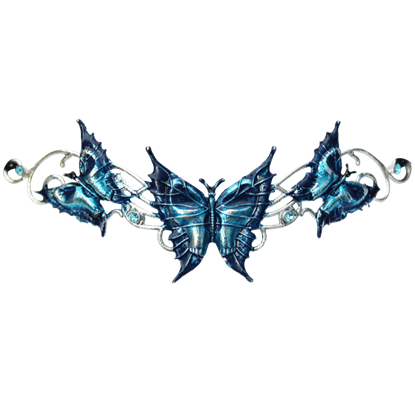 The dress and wings of the fairy feature a range of lovely blue shades. This Bluebell Faerie Necklace for Magickal Dreams is a wonderful marriage of subtly and elegance. 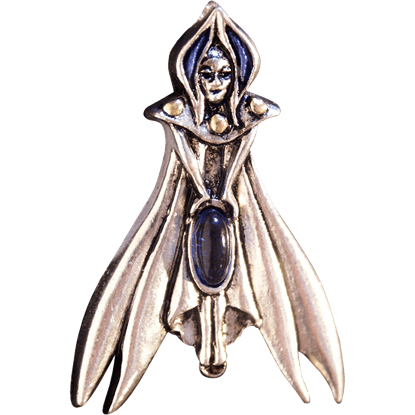 A harmony is met with the smooth silver tones and the blue accents found on this fairy. 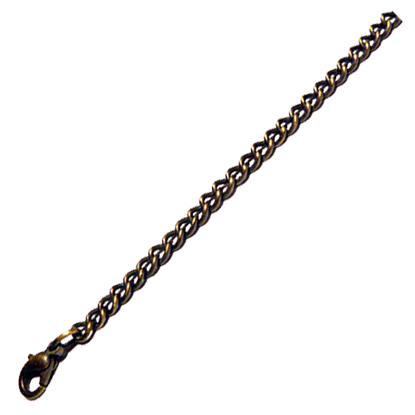 This piece can make an excellent keepsake or gift. According to Celtic lore, the Aos Si are fairy folk who have retreated to their underground lairs as they live out their immortal lives. 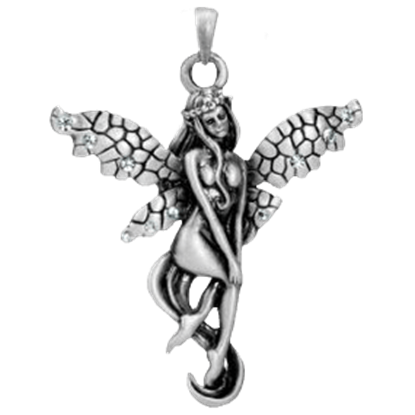 The Celtic Faerie Necklace features one lovely member of the fairy folk at its center. The Celts believed that the fairy folk retreated to hiding places from the invading humans, living in barrows and cairns among other places. 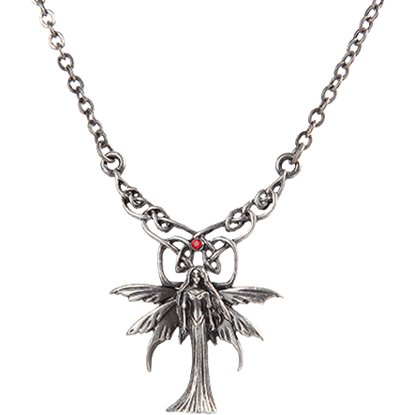 The Celtic Fairy Necklace features an elegant winged fairy in a gown at its center. This sweet fairy likes to fly in style on the back of a colorful butterfly that has just emerged from its cocoon. 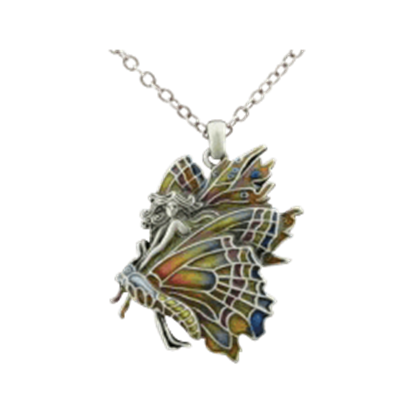 The Chrysalis Fairy Necklace shows off incredible detail inspired by the licensed design by artist Jody Bergsma. Introduce the daring Constance Fairy Necklace into your wardrobe today and allow it to take your style to another level. 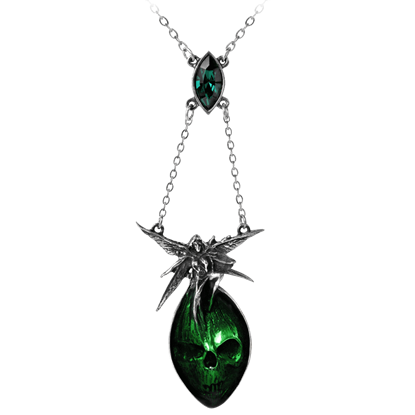 This elegant piece captures the essence of a fantasy realm and creates a stunning accent for you to wear.